A founding member of Italian Instabile Orchestra, drummer Tiziano Tononi has a knack both for re-arranging songs to adapt to his diverse ensembles, and his Southbound octet is no exception. In addition to Tononi on drums and percussion, there’s Emanuele Passerini on soprano and tenor; Piero Bittolo Bon on alto, bass clarinet, and flutes; Emanuele Parrini on violin and viola; Carmelo Massimo Torre on accordion; Joe Fonda on both acoustic and electric bass; Pacho on congas, bongos, and percussion; and Marta Raviglia on vocals. Any tribute to the Allman Brothers needs to bring a mighty rhythm section, and Tononi, Pacho, and Fonda sound tremendous here, driving the band through a woolly, funky take on Allman’s blues-rock. Torre fills in the chordal middle on accordion, and Passerini, Bon, and Parrini play lead on most of the album. 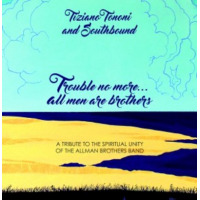 Trouble No More… All Men Are Brothers opens with a stellar, genderbent take on two Allman Brothers classics, “Whippin’ Post” and “Midnight Rider.” Raviglia sings lead. In addition to being a woman singing lines written by and for a man, she flips the phrasing on a lot of signature lines, giving a fresh reading to lyrics I’ve heard dozens upon dozens of times. “Whippin’ Post” is atmospheric and rich, and “Midnight Rider” is barely recognizable. The band takes most of the trademark elements, the guitar riff and shuffle beat, and replaces them with an arrangement that highlights the weariness of rebellion. Tononi composed three songs for the album, including “Requiem for Skydog,” a folkish tribute to guitarist Duane Allman, whose professed admiration for John Coltrane and Miles Davis (particularly, Kind of Blue) creates an interesting feedback loop, with his music now re-arranged for a jazz ensemble. Fonda takes a solo near the end that starts as a duet with Tononi, before the drummer gently drifts away in the final minute. It’s a lovely moment, providing the slightest of breaths before the final burner of a trio: “You Don’t Love Me,” “Soul Serenade,” “You Don’t Love Me (Glorious Ending).” Raviglia returns, again bending the lyrics to her style and Tononi’s hard-driving swing. Fabio Treves guests on harmonica, giving “You Don’t Love Me” one of the more traditional-sounding interpretations on the album, until the bottom drops out midway through and Passerini and Bon take an improvised sax-only duet that leads into a Dixieland coda. I started this review a couple of weeks before Gregg Allman died, unexpectedly, in May. As with his tributes to Ornette Coleman, Don Cherry, and Rahsaan Roland Kirk, Tonini’s celebration of the Allman Brothers Band’s music is joyful, sincere, and revelatory, and with the recent loss of Allman, suddenly timely.